That’s how Kevin Quinn, the Hudson River Park Trust’s man in charge of the $30-million buildout of Tribeca’s Pier 26, describes the structure’s program-packed design. 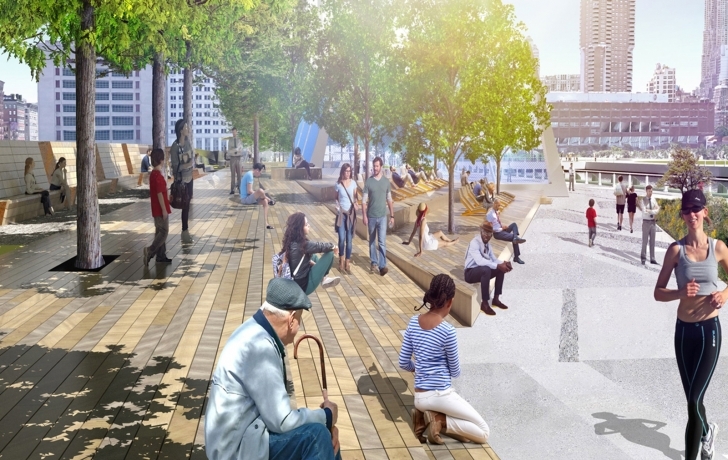 Work on the pier’s two-year transformation is set to begin this summer and last week Quinn showed Community Board 1’s Waterfront, Parks and Resiliency Committee the final renderings of those plans, somewhat modified from the ones first presented more than two years ago. Soccer fields and lounge areas, wooden elevated walkway and protected tidal marsh, ecological study areas and tree-lined lawn. Olin, the landscape architects on the project, was tasked with including a big wish list of community uses for this rare slice of public riverfront real estate. Still uncertain is the planned two-story estuarium building to be located upland between Piers 25 and 26. Only $10 million of the $50 million needed for the river study center is in hand,” HRPT President Madelyn Wils said. “We have set a deadline of the fall to see if we can come up with an anchor donation and based on that, we have a very ambitious plan right now,” she said. That plan includes kindergarten to eighth grade classrooms, three college classrooms, a large technology exhibit and, with the River Project, live displays of local river creatures as well as outdoor programs. Rendering of aerial view of the future pier, due for completion in fall, 2020. Looking west, the lawn with real grass, and trees as they are expected to fill out four years after planting. Seating along the lawn can be seen at left and, at right, the raised walkway. Two kids-sized soccerfields will have blue mesh netting to contain stray balls. The field surface will be made of a "futuristic, plastic-type of grid that drains very well," Quinn said. View of triangular stepped seating with chaise lounges, and in the lower right a "hut" with hammocks. Along the north side of the pier, at left, is bench seating with 42-inch, unclimbable backs that are the same height as the guard rails. The raised walkway, approaching the overlook on the pier's western end. At center is a structure with swings. The overlook, with a view down to the planted marsh area that is comprised of native plants that once grew in the area. Cross section of the pier's western end. The line along the top of the river indicates mean high tide; the line below it is low tide. Between the marsh and the walkway 12 feet above it will be a smaller elevated walkway that will be open only for tours and staff. "We don't pretend that this is a real ecological reconstruction," said the HRPT's Kevin Quinn. "For learning purposes, it's an example of how it used to be. But also we can make it beautiful for you to relax and enjoy."